Got a fever? 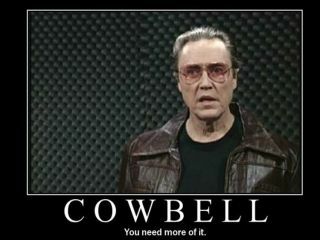 The prescription is more cowbell! Blue Oyster Cult know it. Bruce Dickinson (aka Christopher Walken) knows it. And if you read our Best Cowbell Songs Of All Time list, you'd know it too. You can make any good song great if you just add a little cowbell. Luckily for you, there's software that can help you with this often misunderstood art. MoreCowbell.dj is an application built using The Echo Nest Analyze API. This is a tool that enriches your software's understanding of music. It uses a perceptual model of human listening to generate detailed XML descriptions of a song's structure and musical content to power music applications with a much deeper musical understanding. Or, in layman's terms, it adds cowbell - a little or a lot. And it even sprinkles in the sage advice of Bruce Dickinson - or should we say THE Bruce Dickinson - a man who puts his pants on one leg at a time. Only when he does it, he makes gold records! We tried out MoreCowbell.dj on a number of our favorite tracks, and we must say, the results were simply astonishing. Every song we tested, from beloved classics to undiscovered diamonds in the rough, benefitted from the Dickinsonian treatment. So what are you waiting for? Check out MoreCowbell.dj, and make your songs feverish!